"The Old and the Beautiful" was the second episode of the third season of the Daria TV series (episode number 302). It first aired on MTV on March 3rd, 1999. "The Old and the Beautiful" was written by Rachelle Romberg. However, the seniors are completely turned off by Daria's monotone, unenthusiastic voice (as well as her "unique" choices in reading material), while lavishing praise on the efforts of perkly Brittany and Kevin. In Daria's second go at it, one old man unplugs his respirator rather than listen to her anymore. By the end of the week, Daria is shunned by the seniors and is asked to read to Mrs. Blaine... who turns out to be totally deaf. Dejected and humiliated, Daria is ready to storm out when Mrs. Blaine asks her to read another and tells her that she has a pretty voice. At the end of the week, Jane is banned from the children's ward when she teaches the kids to turn the wall paintings into an Old West battle scene, the Fashion Club donate a single scrunchy, Ms. Li gets the commendation from the superintendent that she wanted, and Kevin and Brittany are praised for their efforts... and Daria voluntarily returns to the nursing home to keep Mrs. Blaine company. The title of this episode is related to the title of a soap opera, "The Bold and the Beautiful." Brittany writes down Kevin's name on the sign-up form - as "Kevvy". Both Brittany and Kevin are surprised Daria is unpopular with old people, but refer to Daria being "an outcast" at school as if it's just a simple fact of life that doesn't need explaining (though Kevin, when pressed, isn't sure he knows why she's unpopular). Daria appears to be more upset about being unpopular with the elderly than about being unpopular at school. Lawndale appears to have a homeless problem. Quinn refers to Brooke, the Fashion Club hopeful from Too Cute, and is eagerly putting the boot in. Brittany is unaware her voice squeaks. This features the second appearance of Daria's Melody Powers stories. At dinner, Daria is reading The Leopard, by Giuseppe di Lampedusa. 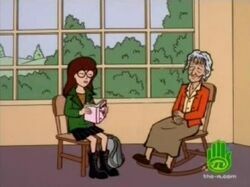 Daria decides to read the seminal Beat Generation poem "Howl" to the old people. This page was last edited on 22 July 2018, at 19:32.